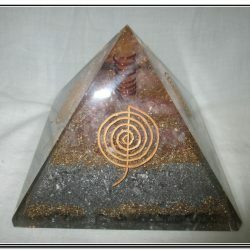 The ‘Sidhe Spiral’ Orgone Crystal Pyramid can best be described as a transmitter of Universal Light, otherwise known as Source energy, that is the animating force behind all creation. The Sidhe pyramid has the capacity to automatically transform lower or negative vibrational energy into higher, positive vibrational energy. 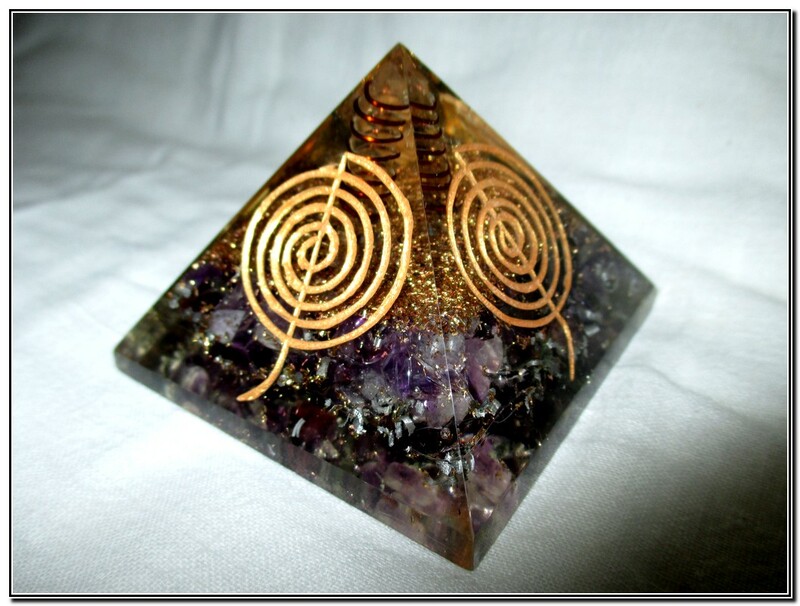 The ‘Sidhe Spiral’ Orgone Crystal Pyramid with its layer of powerful gemstones and a clear quartz generator crystal wrapped in copper like a tower at its heart, can best be described as a transmitter of Universal Light Energy. 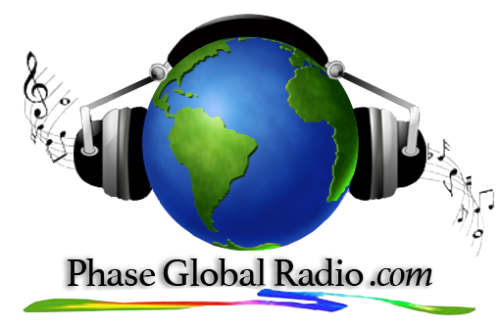 It has the capacity to automatically transform lower or negative energy into higher, positive vibrational energy. 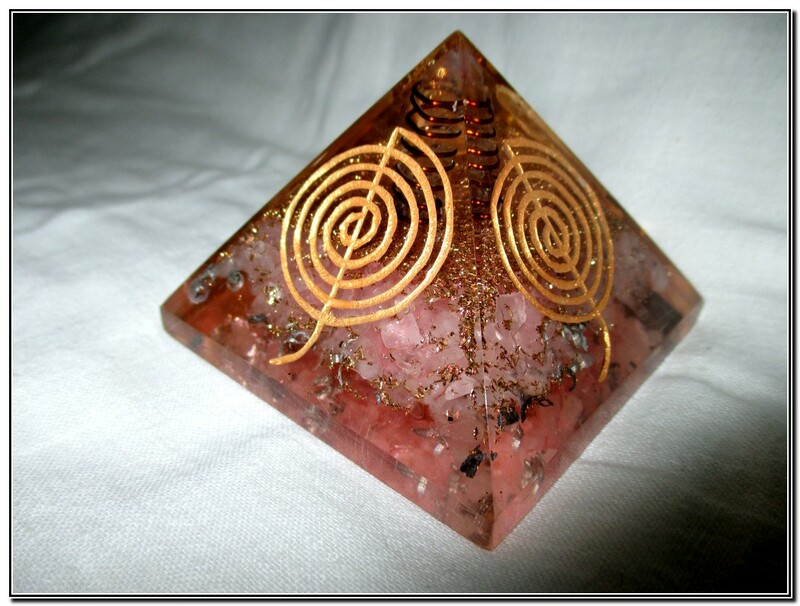 The crystals, chosen for their energetic properties, are encased within a special resin laced with metals including copper, which amplifies and pushes the etheric energy to the capstone of the pyramid, and from there outwards to the user and the environment. Each pyramid features a magnificent gold embossed sacred ‘Sidhe Spiral’ on all four sides, and a copper spiral embedded in the base. Sidhe (pronounced ‘shee’) is the Gaelic name for the fairies in both Ireland and the Highlands of Scotland. It literally means “people of the fairy hills”. 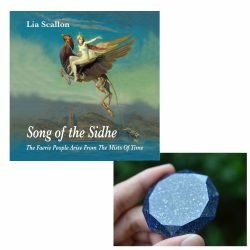 The Sidhe are the descendants of the Celtic gods – a noble, almost human-like race of great beauty and powerful magic who make their home near the lakes, mountains and forests. This particular spiral shape, studded with crystals, was found on the wall of a 4000 year-old underground chamber in Ireland. When archaeological author John Matthews sat in the chamber in front of the Spiral, a Sidhe Messenger appeared to him. 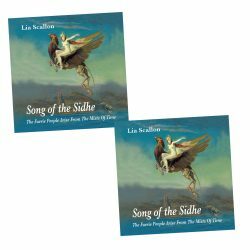 The otherworldly Being told him that this Spiral has the power to act as a bridge between the human world and the world of the Sidhe, facilitating communication one with the other. 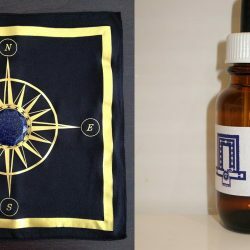 Coined by Dr. Wilhelm Reich, Orgone has been described variously by the Great mystics and philosophers as Chi, Prana or simply the Force. Dr. Reich, an Austrian scientist, philosopher and psychoanalyst; developed a technology to tap into the Cosmic Orgone Sea to provide a continuous stream of Life-force energy. 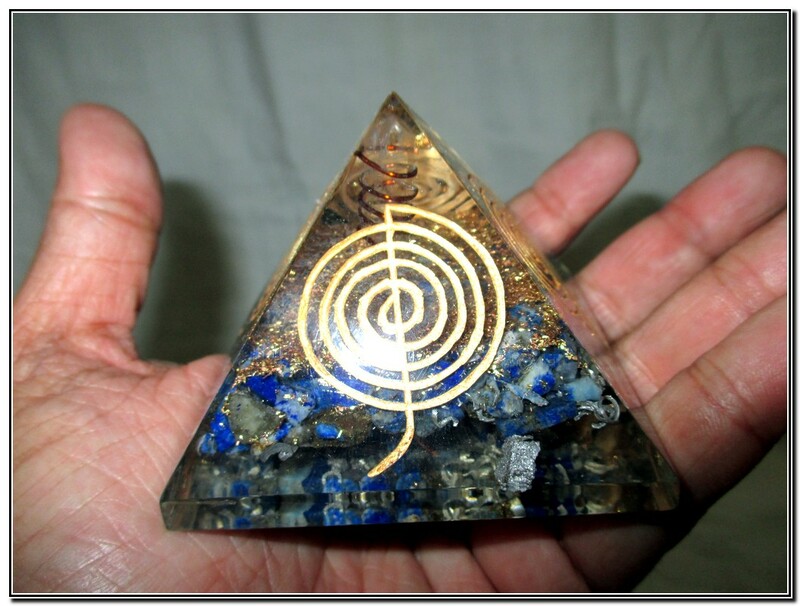 The possible uses for this orgonite pyramid device therefore, are limited only by your imagination. 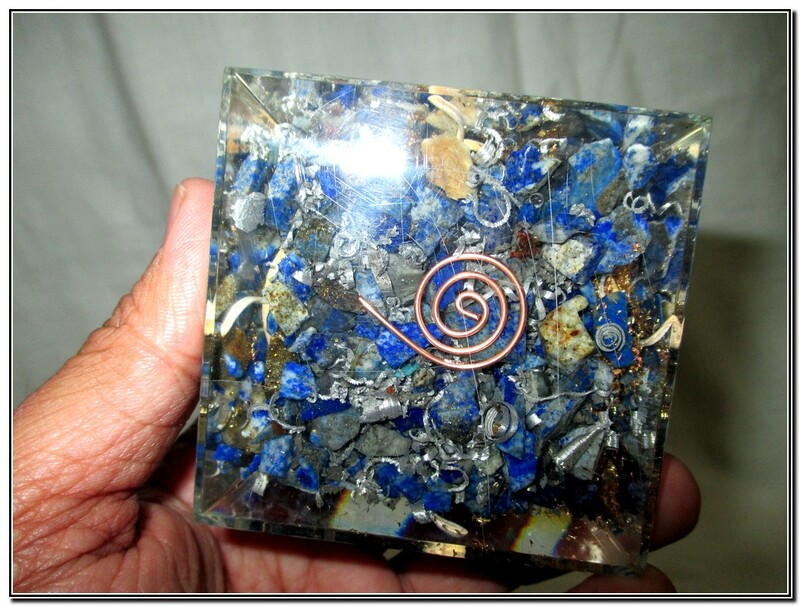 When the special orgonite resin cures, it compresses all of the crystals in the orgone device creating the PEIZO-ELECTRIC EFFECT, which is then emitted outwards from the crystal. The metal acts like a booster antenna for sending the electrical energy forth. 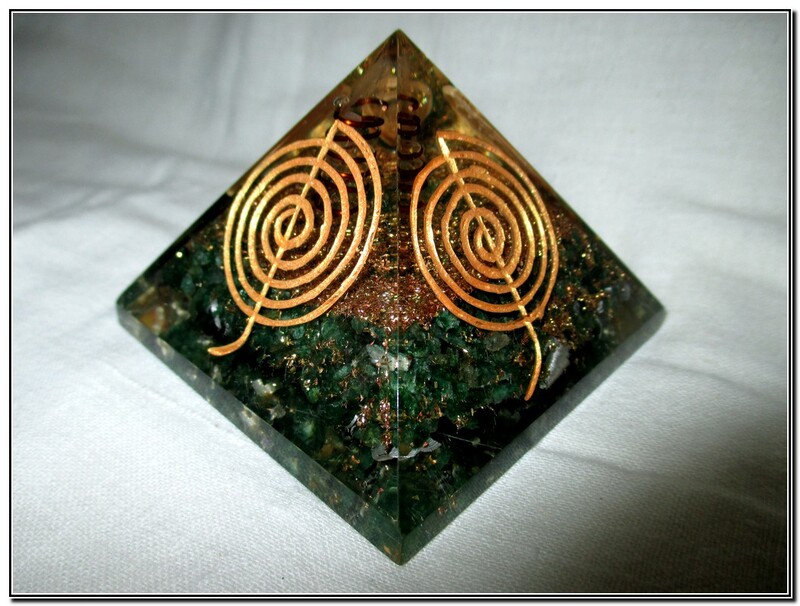 Orgone energy can be quantitatively measured with an EMF-meter (electro-magnetic-frequency). These organite pyramid devices cause most metres to go off the charts! This energy can be felt! Muscle Testing has shown that having an organite chip on your cellular phone will change the phone from weakening its user, to strengthening them. It reverses the negative ELF radio waves emitted by your Cell Phone, TV, Microwave, Computer et cetera. 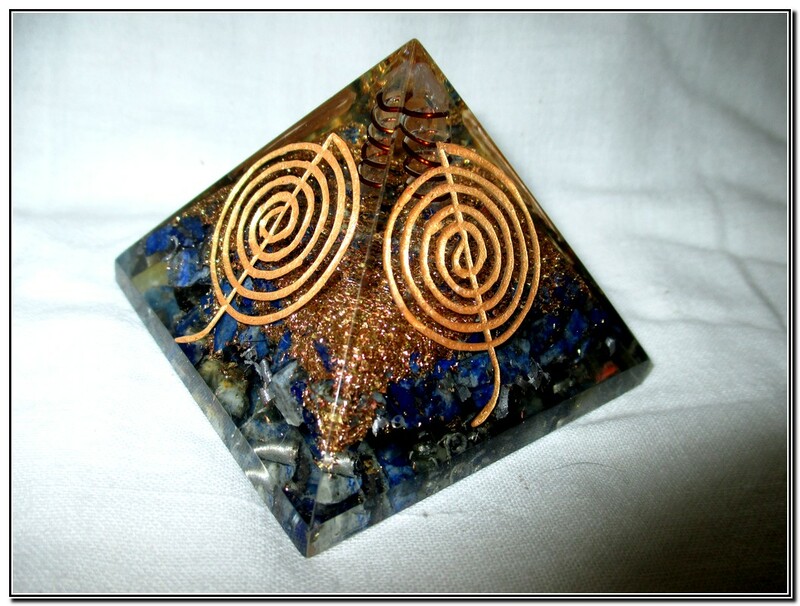 You can feel an increase in the orgone coming out of the device when it is placed on top of a running TV or Microwave. 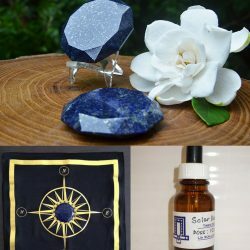 The negative radio waves that would interfere with your DNA and nervous system are routed through the resin and crystals, effectively purifying the energy. 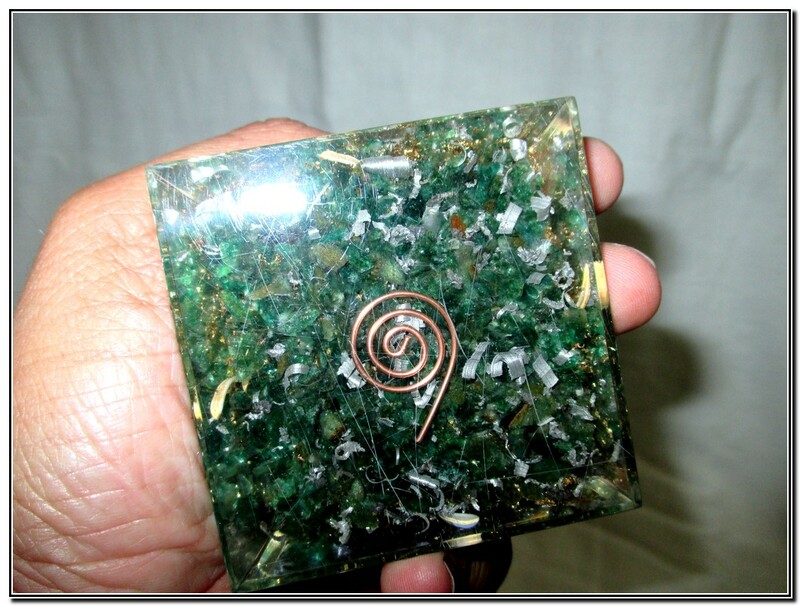 It has been reported that orgone reverses the effect of the negative energy experienced under high power lines and near atomic power-plants. 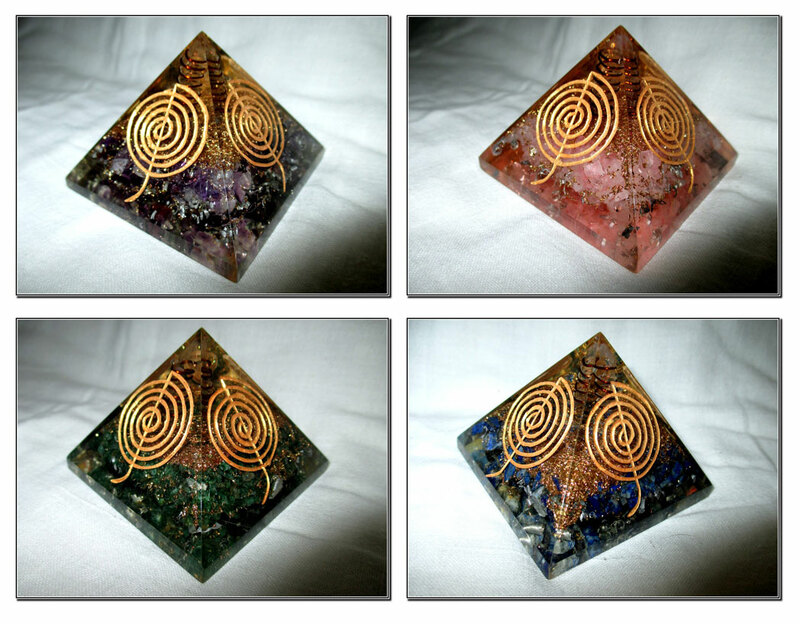 To eliminate the effect of sleeping near an alarm clock or power outlet, place an orgone close by. Water will also become more ALKALINE in ph level -usually above 7.3. 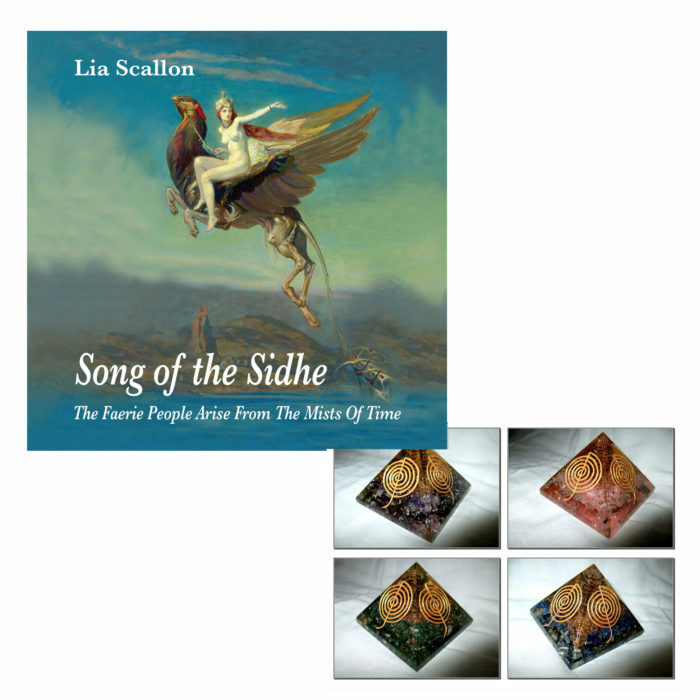 The pyramid shape, on which the Sidhe Spiral appears has been used by man for at least 5000 years. 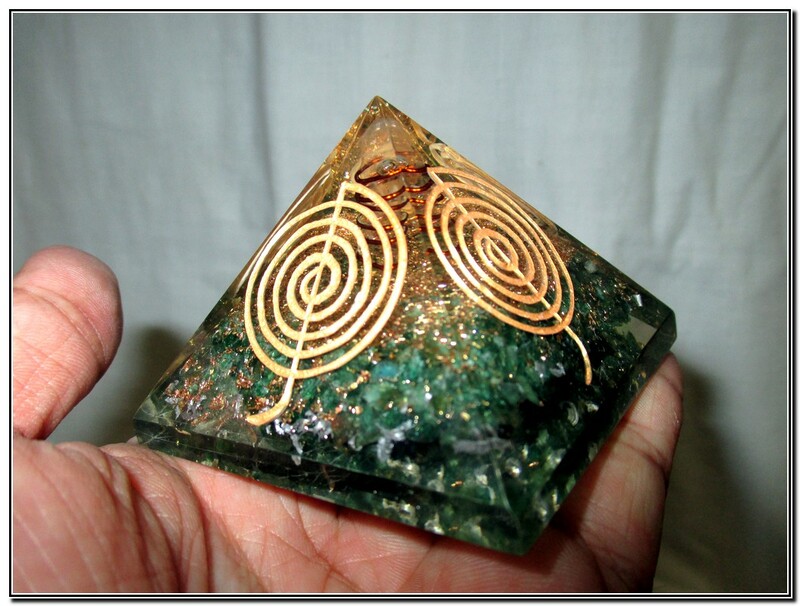 Combined with Orgone which is the basic building block of all organic and inorganic matter on the material planet, the sacred geometry Sidhe Spiral, the amplifying power of the crystals, and the copper which conducts it, these Pyramids have the ability to harness Universal Life Force. 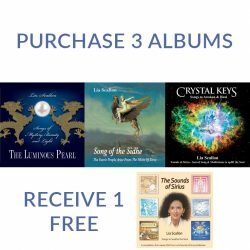 They are therefore powerful Spiritual tools that can enhance your life physically, mentally, emotionally and spiritually. 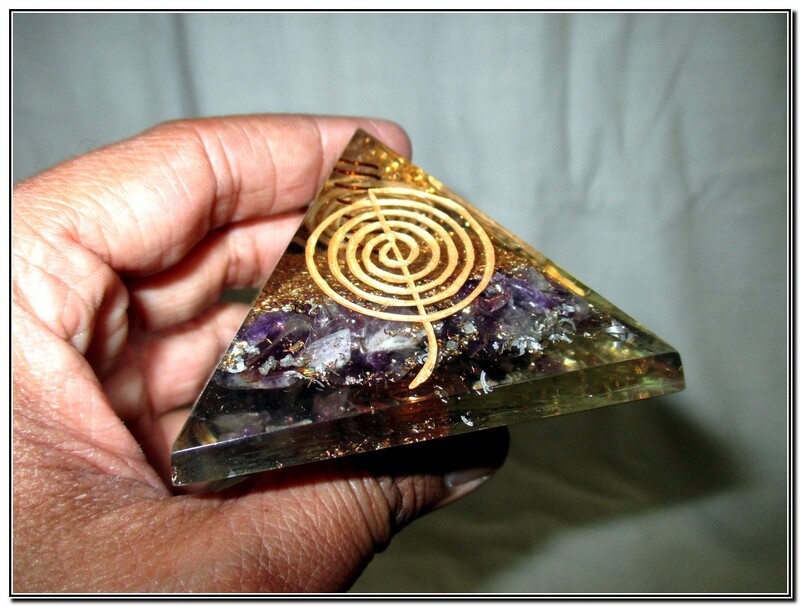 The Pyramid shape is believed to be a supernatural source of power and energy that has a generally balancing effect on the electromagnetic field of the body. Pyramids amplify and then tightly focus energy through the apex. They can be used to draw off negative energy and blockages from the Chakras. A gemstone pyramid is also used to enhance and focus the inherent properties of the stone. Pyramids are known to preserve foods for twice or three times the normal lifespan, as well as changing the taste of foods to become less bitter or acid. The pyramid will dehydrate food without decay or mould growing, slowing or completely stopping of the growth of microorganisms. The actual molecular structure of the food has been shown to change. Egyptologists have found well-preserved grain in tombs that is thousands of years old. In sharp contrast, grains stored in modern silos usually spoils after only a few seasons of storage. Several unique and beneficial qualities may be derived from Pyramid Meditation. Theta and alpha brain waves are increased, and experienced meditators have reported profoundly expanded awareness. Many say that their psychic powers are stimulated and heightened by the use of pyramids, resulting more rapidly in an altered state of consciousness. Placing a pyramid on the head and focusing on the chakra system can clear energetic pathways that may have become blocked. Pyramids generate negative ions. Negative Ions help to reproduce and repair body cells. They are transmitted into the body through the air and are circulated by the blood and are believed to have a generally balancing effect on the body’s electromagnetic field. This effect is greatly enhanced if the materials used, is gold or copper. Researchers discovered that items placed under a pyramid stay “charged” for various lengths of time after being taken from under the pyramid. Crystals and water keeps their charge longer than anything else. Quartz crystals will hold the charge for several weeks. 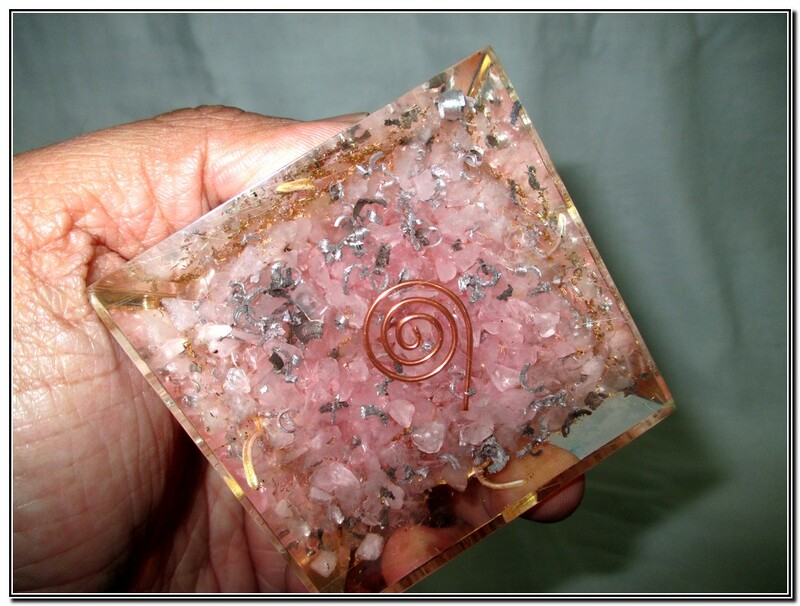 These crystals can then be used for healing purpose as they release their charge into the surrounding environment. Copper has been used in the physical and mental healing rites of many peoples of this world for eons. It is a wonderful physical conductor of electricity and heat and according to myth, copper also has the ability to conduct spiritual energy back and forth between individuals, crystals, auras, the mind and the spirit world. It is believed that copper has the power to amplify thoughts when sending and receiving psychic communications. Copper is used with crystals to strengthen the properties of them. On a physical level, copper is used to alleviate cramp-like symptoms, and is said to promote the smooth functioning of the glands. It can help prevent wear and tear and calcification of the joints. Its healing properties also help in improving the circulation of blood, increasing energy, detoxification, reducing inflammation, stabilizing metabolism and improving oxygen use. 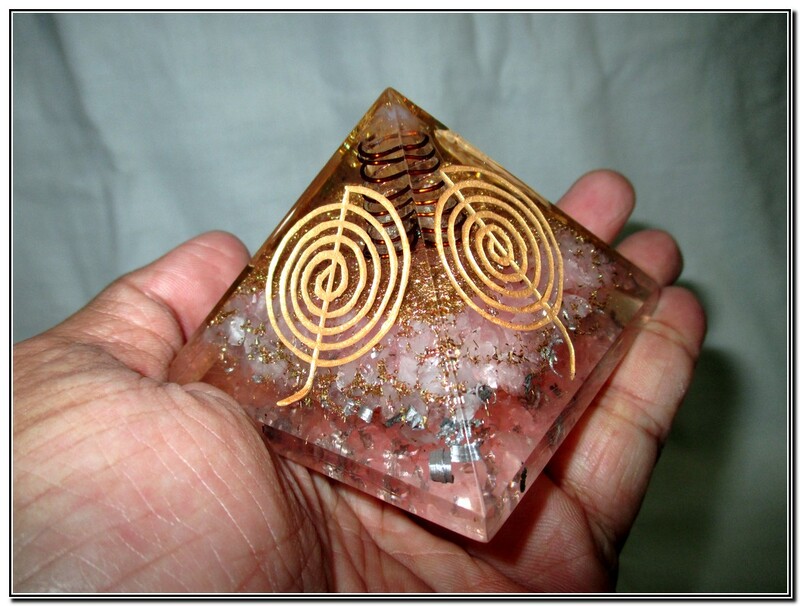 By simply holding an Orgone Pyramid device or being near one, negative energy will be cleared from your field creating a higher, more balanced and healthy state. Using your Intent you can also direct this Source Energy towards personal healing, protection and spiritual awakening. What this means is that you now have a practical tool that can create and maintain a positive energy field in your home and workplace for both yourself and those around you. 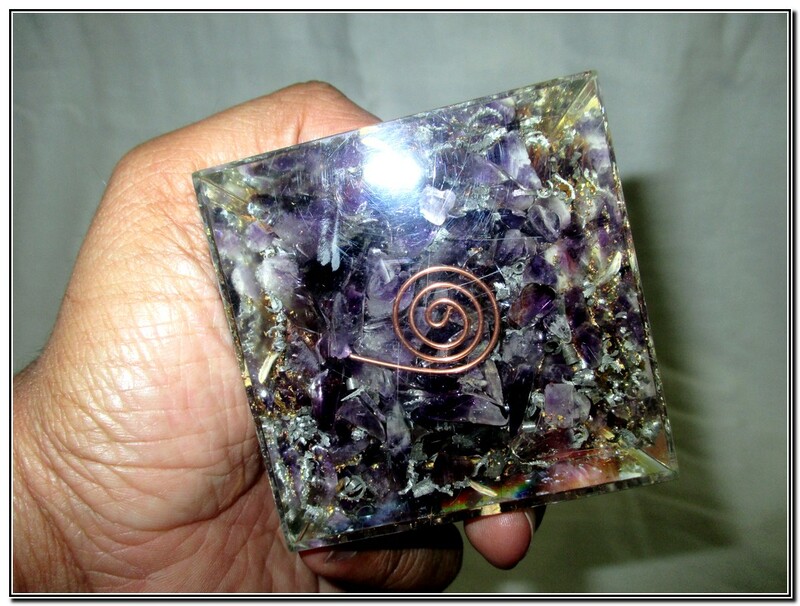 Orgone is thought my many people, to be one of the most advanced Spiritual tools available today, easy and beneficial for anyone to use.